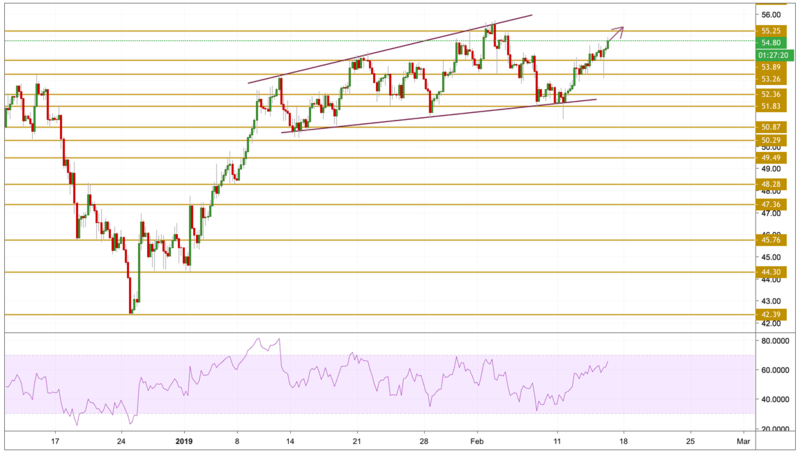 In a very volatile session, WTI ended up positive on Thursday, following a sharp sell-off that took out the prior day's lows, before the bulls charged back pushing prices back up to overnight highs. Investors are trying to second guess the outcome of trade talks that are ongoing between the US and China, with hot to cold headlines creating volatility in the market based on supply and demand fears. Lending support to the upside comes with Saudi Arabia, pledging earlier this week to cut output further in the coming months, according to the Financial Times that was citing oil minister Khalid Al-Falih. Russia and Saudi Arabia are accelerating the required cuts under the latest OPEC+ agreement. Adding to the upside case, involuntary declines from Iran and Venezuela are also likely to underpin a bull market. Crude oil prices continued to edge higher breaking above the $54 level again as expected and looked so close to breaking the $55 level. The price is currently continuing yesterday's run with a bullish momentum as the RSI shows. Overbought conditions are yet to be existed. We will be focusing on the $55.25 resistance level.